Oh his own at age 14, Arnez J lied about his age to get a job at a gas station to work his way through school. Early plans were to be a professional baseball player. A Philadelphia Phillies Farm League pursued him, but that fell through. It was later while working as a flight attendant that he discovered his comedic talent and had the ability to keep the passengers and crew laughing. With much encouragement from friends, Arnez J made his first attempt at stand-up comedy. After that first night on stage, he knew what he wanted to do. 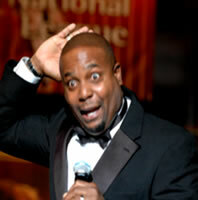 After leaving his job with the airlines, Arnez J made the decision to devote all of his time to a career in comedy. The Harlem Globetrotters recruited Arnez J after their scouts saw his very physical comedy routine at a local celebrity basketball game. However, Arnez J suffered a minor knee injury that forced him to put his basketball career on hold. An Atlanta native, Arnez J began working the comedy circuit in Georgia, quickly becoming one of the most talked about comedian, deem one of "Hotlanta's" funniest newcomers. His charisma and physical agility are unforgettable. 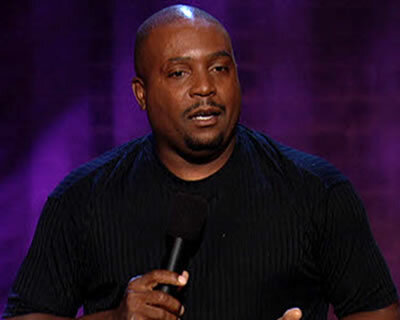 Diverging from the hard-edged streetwise observational styles of other contemporary African-American comedians, Arnez J offers comic routines reminiscent of an earlier era of comedy. His improvisational comic style is primarily physical, with a strong reliance on impressions and exaggerations of familiar personalities. "His brand of comedy has dubbed him "the black Jerry Lewis". Arnez J is a whirling dervish on stage--he runs, jumps, spins, slides, slips, and mugs through a performance, acting out many of his bits while describing them," wrote Doug Kaufman in the St. Louis Post-Dispatch. His idols are the classic television comedians of the 1960s: Flip Wilson, Red Skelton, and a performer who might be considered an unlikely inspiration for a modern African-American male artist. "There was never a nicer and funnier comedian to me than Carol Burnett," Arnez J explained to Daniel Neman of the Richmond Times Dispatch. "The Carol Burnett Show, to me, will never be replaced". As his career developed, Arnez J branched out into new activities. He toured with actor Billy Dee Williams in a play called The Maintenance Man, playing a nightclub owner, and he performed as an opening act for the Artist Formerly Known as Prince. Arnez J moved to Los Angeles, and indeed film seemed to offer the best new potential avenue for his talents. He starred in the independent film Up Against the 8-Ball, and hoped to make more movies. "We've missed good slapstick comedy," Arnez J is the ideal performer for the revival of a type of comedy that had gone out of fashion. 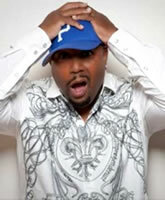 Arnez J was immediately noticed by the entertainment industry and was asked to make his first television appearance on Showtime's "Comedy Club Network." Numerous television appearances soon followed including recent appearances on "The Keenan Ivory Wayans Show," "Louie Anderson's Comedy Showcase," Comedy Central's "Make Me Laugh," NBC's "Friday Night Videos," Russell Simmons' "Def Comedy Jam," his own BET "Comic View Grandstand ½ Hour Special" and many others. In keeping with his plan, Arnez J keeps up a dizzying pace performing for sold out crowds in clubs, colleges and concert halls across the country.